Plan Toys 64160 - This set is designed with a curved wooden base. 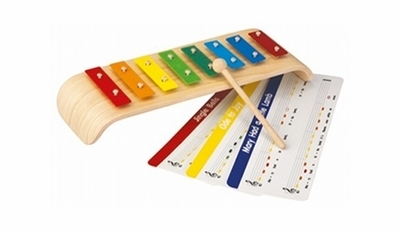 The eight colored bars produce musical notes true to scale. Sheet music are included: Jingle Bells�, Ode to Joy�, and Mary had a Little Lamb�. Made of rubber wood and painted with non-toxic soy paint. Measures 13.8" x 4.7" x 2.4".